China is making friends right under America's nose. Latin America is China's latest business buddy. Chinese banks increased investments in Latin America by 71% last year, and the country plans to double its trade volume with the Central and South American region over the next decade. This comes as U.S. power in the Americas is starting to erode. U.S. cash is actually fleeing the region as investors see better deals at home or elsewhere. China doesn't appear as worried about the short-term. "What we're looking at is not simply an economic play. It's an economic play that also has political and strategic undertones," says Ilan Berman, vice president of the American Foreign Policy Council in Washington. Outside of economic ties, Berman points out that China has helped fund Argentina's nuclear power plant, launched Bolivia's first satellite and is rumored to be helping Venezuela start its own drone program. But for now, the relationship is mostly economic. Trading Places: Although America is still the No. 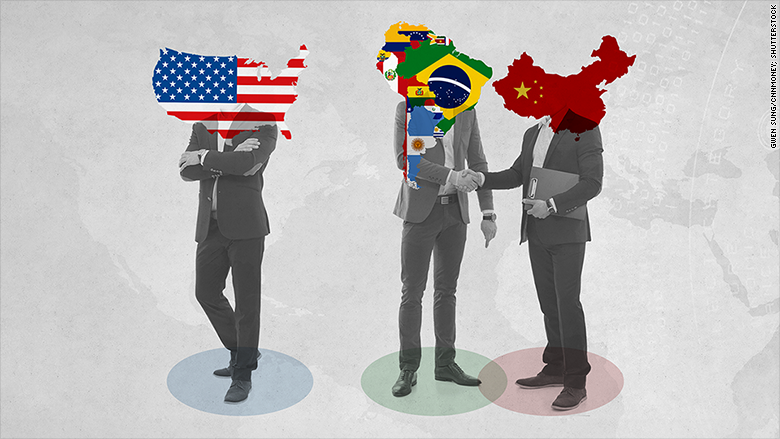 1 trade partner with Latin America, China is already beating it in some places. China is ahead of the U.S. in trade with Brazil, Argentina, Peru and Venezuela, according to M.I.T. data. It's a win-win for China and Latin America for many reasons. China needs all of Latin America's abundant commodities, like oil and soybeans, while some Latin countries are desperate for cash, which China is happy to provide. In a sign of the shifting alignments, Latin American countries formed an alliance in 2010 called CELAC (Community of Latin American and Caribbean States), which excludes the U.S. and Canada. Two months ago, the CELAC countries held a big meeting. Instead of going to Washington, they went to Beijing for the first formal conference between China and the region. Of course, the new friendship isn't entirely sunny. Chinese and Latin American economies are slowing down. Demand for goods is declining in China, and Latin America is at the end of a commodity boom, straining ties. But the potential for long-term ties is strong. China's President Xi Jinping has vowed to double trade between his country and Latin America over the next decade to $250 billion. "China provides a source of financing and export markets without pressures to adhere to practices of transparency, open markets, and Western style democracy," says Evan Ellis, a Latin American expert and professor at the U.S. Army War College. Venezuela is a good example. As the country's economy flounders -- some have even dubbed it the worst in the world -- China stepped in, lending the South American nation billions in exchange for oil. 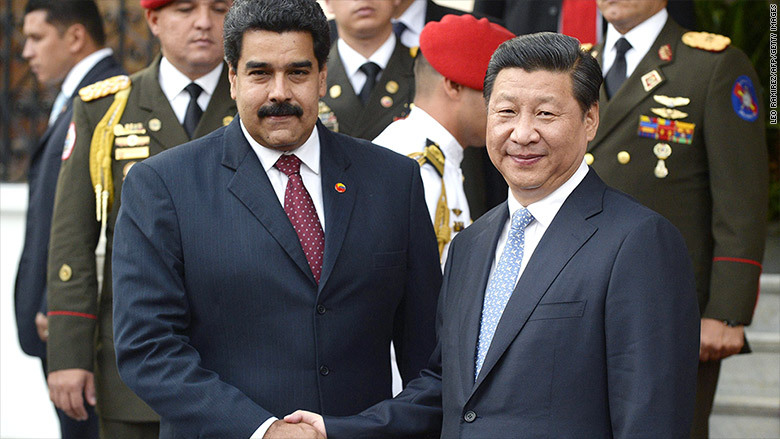 Venezuelan President Nicolas Maduro, left, shakes hands with China's President Xi Jinping. Money talks: China's banks lent $22 billion to Latin America last year. That's more than the World Bank and Inter-American Development Bank sent to the region combined, according to Margaret Myers, an expert at the Inter-American Dialogue, which is not associated with the bank. "These countries have really welcomed China with open arms," says Myers. Meanwhile, U.S. businesses are losing interest in Latin America. Direct investment from U.S. firms to Latin America has declined almost 20% since 2011, according to Commerce Department data. Despite the recent Cuba announcement, Latin America remains low on America's policy priorities, some say. 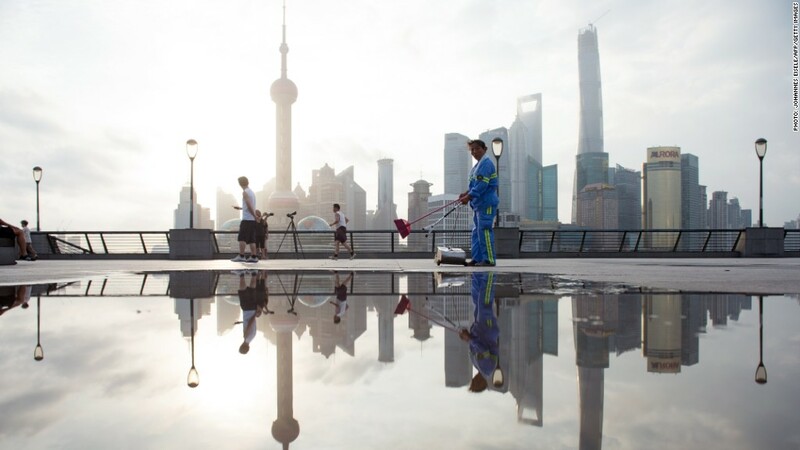 Its sleepy attention toward Latin America has allowed China to capitalize. "As western capital retreats from Latin America...there's a vacuum there. Why wouldn't the Chinese want to fill that?" says David Morton, an emerging market expert and chief equity strategist at Rocaton Investment Advisers.